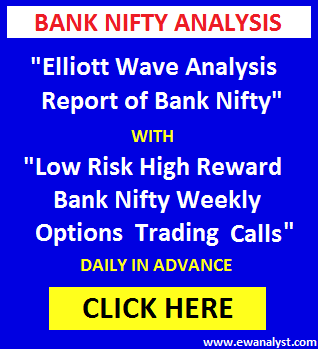 Bank Nifty opened lower at 24133, registered low 24110 and bounced back again to registered high 24355 but didn’t sustain at that level and declined back again by more than 250 points to register low 24082 and finally closed 76 points down at 24168. Yesterday, I had mentioned that for short term Bank Nifty still in negative zone and has possibility to decline further towards 24186-24048 either from present level or 24363-24473 range in coming days. 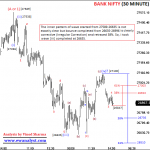 24473 was the breakeven point on upside above which we can expect further bounce. Buying in Bank Nifty Puts were suggested in 24430-24473 range with exact stoploss of 24521 expecting target 24186-24048 in coming days. 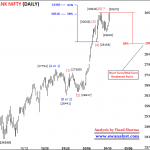 Bank Nifty achieved targets but declined without hitting resistance zone. Now, we need to analyze fresh charts for further updates. 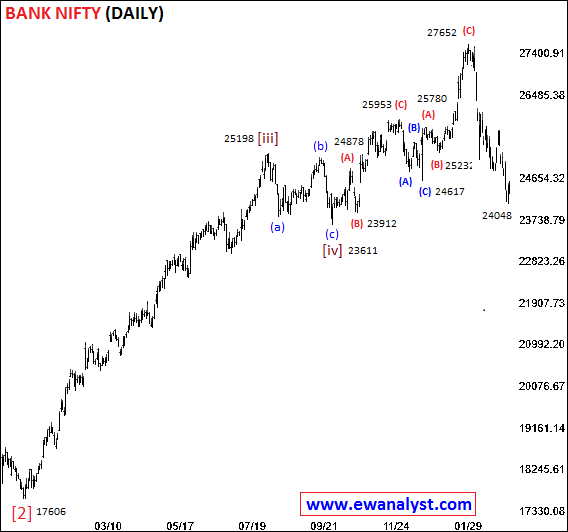 This is Daily time bar chart of Bank Nifty which I am expecting as start of wave . This is the same chart with explanation which I had explained in my last report because there is no change in wave counts on this chart. It seems wave [i],[ii],[iii],[iv] may be completed till 23611 and wave [v] may be in progress from 23611. Wave [v] achieved its 38% projection placed at 26511 whereas 61% projection placed at 28302 which may or may not achieve. Within wave [v] after 23611, the bounce is combination of repeated (ABC) waves. 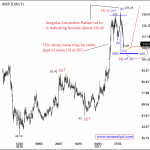 So, either there is Ending Diagonal Triangle pattern in progress or it is Irregular Correction at top. Exact pattern is not yet clear, so we need to concentrate on the decline started from 27652 until we get clarity. 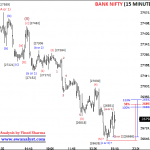 This is Hourly time bar chart of Bank Nifty covering decline from 27652. 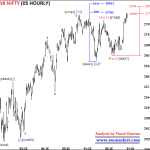 It seems that the decline started from high 27652 is impulsive with wave 1 completed from 27652-27116, wave 2 may be completed from 27116-27613, wave 3 may be completed from 27613-25023, wave 4 may be completed from 25023-25723 as irregular correction and wave 5 may be in progress from 25723. Wave 5 achieved its minimum 38%-61% projection placed at 24718-24098 whereas 100% placed at 23094 which may or may not be achieved. 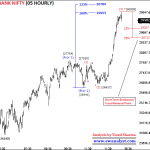 Bank Nifty achieved 24048 till now. Within wave 5, it seems wave (i),(ii),(iii) may be completed till 24048, wave (iv) may be completed at 24939 as Double Zigzag Correction and wave (v) may be in progress from 25009. 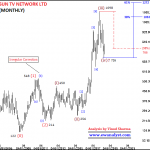 Minimum 38%-61% projection for wave (v) of 5 is placed at 24299-23903. But end of wave (iii) of 5 is at 24048, so 24048-23903 is the minimum expected target range for completion of wave (v) whereas 100% placed at 23264. Overall, this big impulse started from 27652 is within its last inner wave (v) of 5 and we can expect minimum 38%-61% bounce after completion of this correction which will be about 1300-2000 points from low. Now, we need to analyze the wave (v) started from 25009 on separate low frame chart to check its inner waves. This is 15 Minute time bar chart of Bank Nifty covering move from 25009 which I am expecting inner wave (v) of 5 on the previous chart. 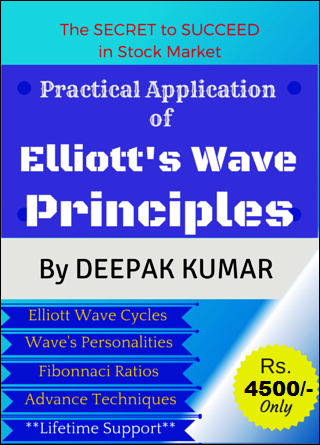 It seems wave completed from 25009-24487 may be wave (A or 1), wave completed from 24487-24939 may be wave (B or 2) and wave (C or 3) may be in progress from 24939. 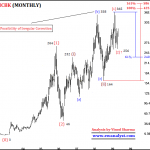 Within wave (C or 3), it seems  may be completed at 24762, wave  may be completed at 24906, wave  may be completed at 24110 and wave  may be completed at 24355 or still in progress. Minimum 38%-61% projection for wave  is placed at 24038-23842 which is the expected target range for completion of wave , if wave  already completed at 24355. Wave  is still short of minimum 38% projection, so 38% retracement of progress of wave (C or 3) placed at 24426 is still the immediate resistance on upside and same can be used as stoploss for shorts. 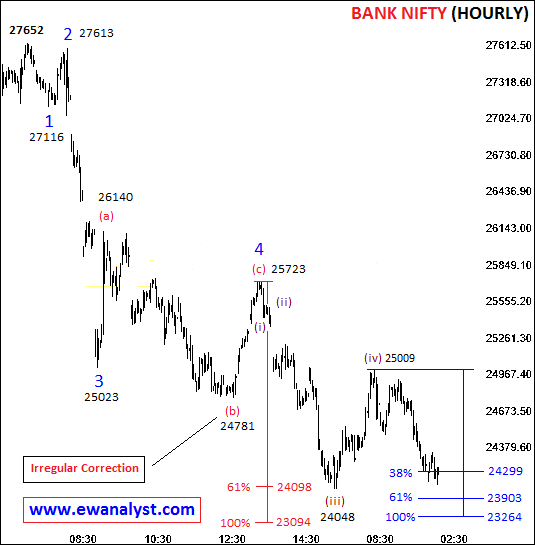 There is no change in outlook, For Short Term, Bank Nifty still in negative zone and has possibility to decline further towards 24048-23903 either from present level or from 24355-24426 in coming days. 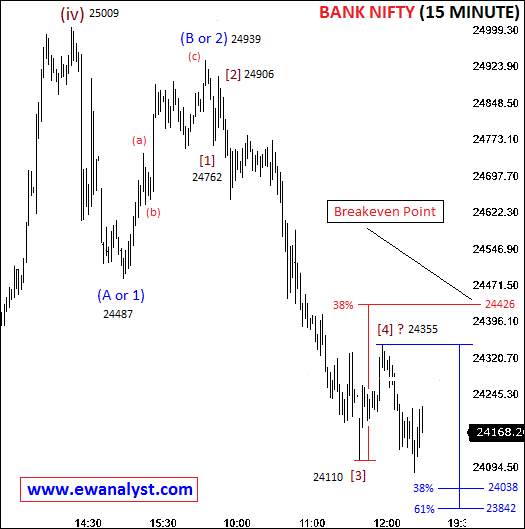 24355-24426 is the immediate resistance and 24426 is immediate breakeven point on upside above which we can expect further bounce and same can be used as stoploss for any shorts. For medium term, a big impulse started from 27652 is within its last inner wave (v) of 5 and we can expect minimum 38%-61% bounce after completion of this correction which will be about 1300-2000 points from low. So, we can expect minimum 1300-2000 points bounce after achieving 24048 but exact bottom cannot be calculated yet. We need to keep all these conditions in mind while planning next trade. For Intraday/very short term, Bank Nifty if get in 24380-24426 range then 24500 Put of 22 March expiry can be bought using exact stoploss 24479 (some points above 24426) expecting target 24048-23903 in coming days. For medium term, there is possibility of minimum 1300-2000 points bounce after achieving 24048 but we don’t have exact bottom. So, Bank Nifty if get in 24048-23903 range then 25000 Call of April Expiry can be bought without stoploss and wait for next update. But buy in light quantity because we are buying without stoploss.